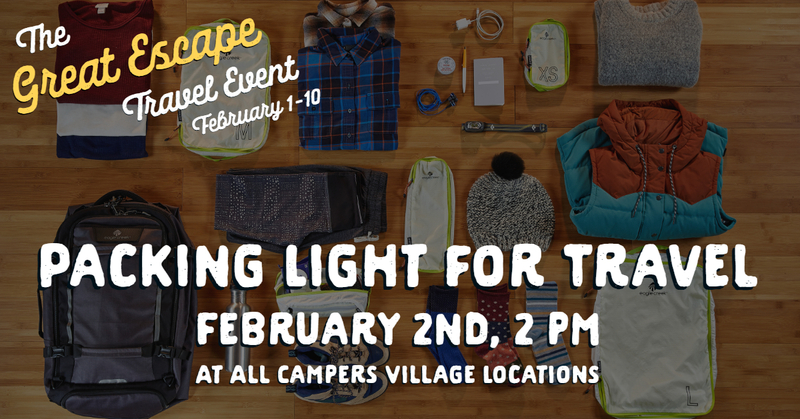 The Great Escape Travel Event returns to your local Campers Village from February 1-10. 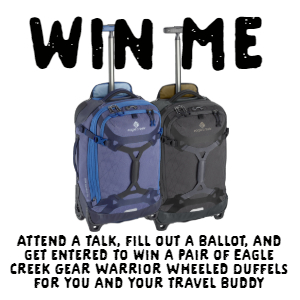 The Great Escape Travel Event features a variety of free-to-attend travel seminars, exclusive discounts, and the chance to win a grand prize package from Eagle Creek valued at over $600! 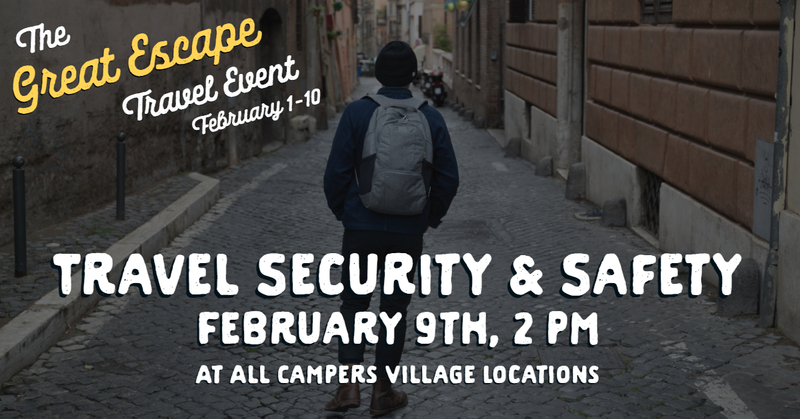 Scroll down to see the line-up of talks scheduled for your local Campers Village, and visit us in-store from February 1-10 to shop exclusive sale items. Have you ever arrived to your long-awaited travel destination only to have to lug a massive, over-stuffed piece of luggage with you? We can help with that! 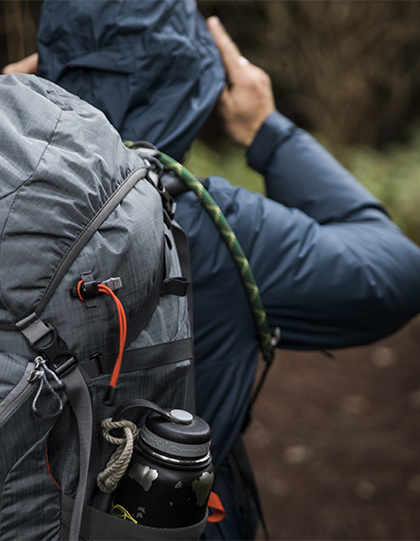 Attend this talk for tips and tricks on what and how to pack light. Are you planning an adventure with your 4-legged friend this year? Do you know how to prepare? 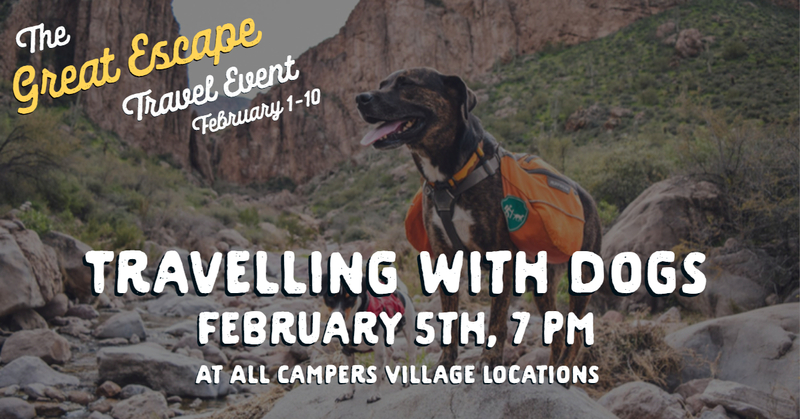 This talk will cover what to pack, first-aid basics, trail etiquette, and essential gear to prepare your pup for an outdoor adventure. Do you have an interest in volunteer travel? Are you looking to give back? 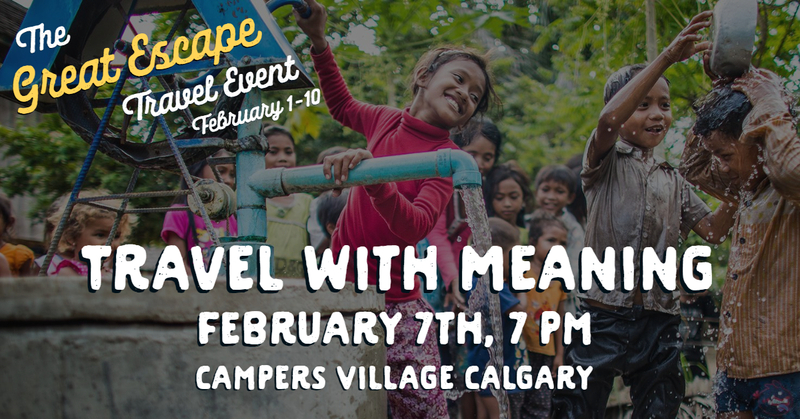 Attend this talk at our Calgary location where we will speak to some opportunities that exist, how to select a cause you can genuinely contribute to, and what to look for when deciding to travel with meaning. They say a picture is worth a thousand words, so when you want to remember and relive your vacation, nothing beats a great picture! 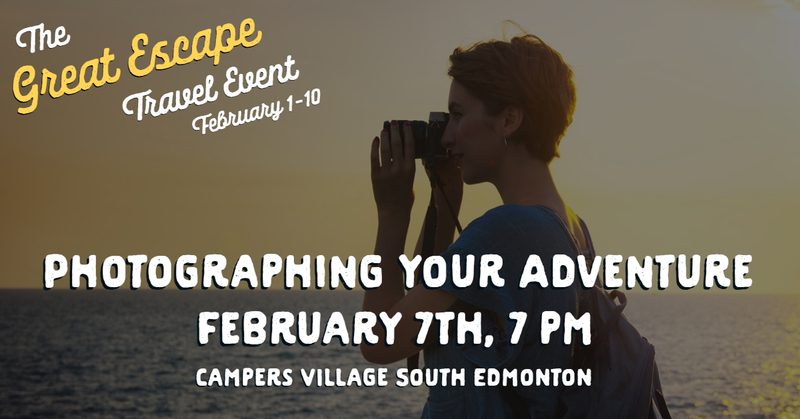 Attend this talk at our South Edmonton location where we will talk about photography tips, keeping your camera gear safe, and other insights and tricks to help you capture the perfect memory. Ever considered travelling to experience local cuisine, or touring through vineyards, breweries or distilleries? 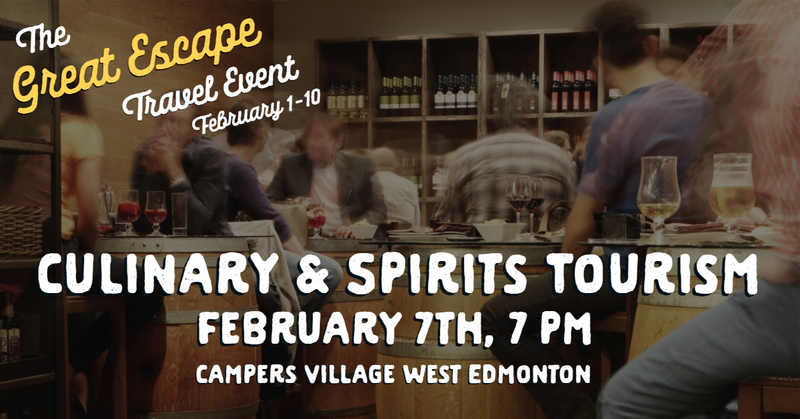 Our West Edmonton Location will be talking about what to consider when booking a trip around culinary experiences, and Rig Hand Distillery will be on-site to discuss distillery tours. Travel closer to home and embrace the snow! 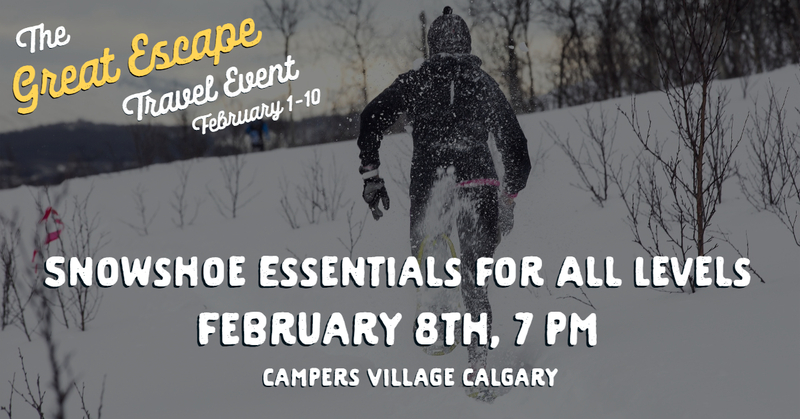 Attend this talk at our Calgary location where Interpretive Guide and Snowshoe Expert, Keri Bowzaylo, will speak to insights, tips, tricks, safety, what to pack, where to go snowshoeing, and more. Nothing can ruin a vacation faster than theft! Join us for this presentation where we will be talking about luggage security, packing tips, types of daypacks, what to look out for, and how to carry yourself day-to-day during your vacation to minimize your risk.